It’s the 21st century and yet, we’re still handling our company cultures like we operate in the 1980’s. Collecting and shipping orders with Excel spreadsheets, messy closets full of branded gear to sort through, and the constant research and guesswork to know which items employees will love. All of that work to provide custom corporate apparel, but are your employees really repping the brand outside of work? AXOMO was designed to help organizations build communities around their brands and save time with automation and simplified distribution. We’ve found several common painpoints shared between those in the HR and Marketing fields that explain why finding an efficient way to improve brand engagement is such a big deal. Employees have very little buy-in when the branded gear they’re given doesn’t fit their style. They’ll use it if it’s required or practical for the moment (and they may even appreciate the gesture) but beyond that, there’s no attachment or pride towards the item(s). Most of these branded goods either end up in the trash, re-gifted or donated, or simply kept out of guilt. Unwittingly, managers create thousands of awkward situations because they misunderstand their people’s wants. What they hope for, when giving the gifts, is momentum … in the forms of increased pride for the brand and happier ambassadors to expand the work. Unfortunately, what they often get for that investment is: silent disappointment, a brand that’s under-represented after hours and on social media, and unimpressed employees who are, statistically, already looking to move on to their next job opportunity. Time is money, and organizations exhaust WAY TOO MUCH of it trying to coordinate, process, and distribute company orders. It’s mind-boggling that we still create spreadsheets and follow up with every person of interest in order to gather sizing, color, and payment information (let alone repeating all that with multiple locations). Even if companies have some form of structured rewards program, their administrators are repeatedly interrupted with questions like “When will I get my gear?”, “How much credit do I have now?”, etc. Today’s consumers are accustomed to speed, information, and options. They bristle at limitations and they’re willing to pay a premium for the things that express their lifestyle. In the professional realm, a lot of organizations are turned off to idea of offering merch, because they’ve seen the mounting, outdated mess of apparel and promo items that accumulate in their marketing closet. Bulk orders certainly play an important role in a company’s strategy, but without order minimums, style choices could be limitless. There’s a lot of research and guesswork that goes behind ordering custom branded apparel. Picking the right brands, offering the best designs, collecting sizes, and fulfilling orders – without having a definite method of tracking ROI. HR and marketing have no idea which products employees love most, and all the while, employees sense an awkward pressure to tout their workplace in public. The battle to maintain consistent branding across all fronts is both extremely real and ongoing. The problem perpetuates with multiple vendors touching the artwork, branch locations ordering outside of brand guidelines, makeshift advertising pieces that aren’t even known to corporate, or outdated materials getting circulated to the public. 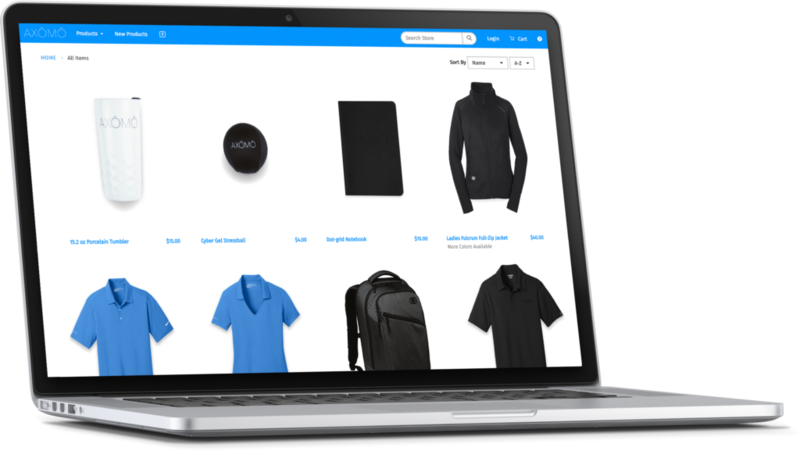 AXOMO is a store platform that allows you to design, sell, and distribute branded gear all in one place. You’ll not only save time, you’ll also be able to offer more options for corporate branded items and apparel than ever before. 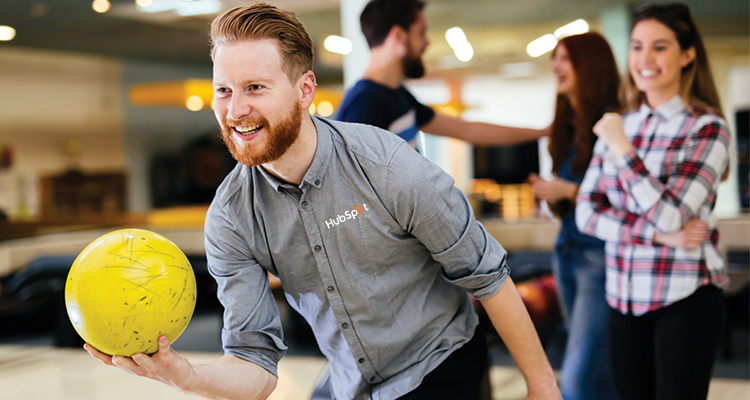 Manage your brand and engage the team, start your 30-day free trial or book a demo with one of our representatives to find out how you can improve brand engagement with AXOMO.